Manmathan, H. and Lapitan, N. L. (2013). Measuring Germination Percentage in Wheat. Bio-protocol 3(16): e866. DOI: 10.21769/BioProtoc.866. Knowledge of the viability of seeds is a prerequisite for establishing the seeding rate in crop production and for germination-related trait evaluation in crop plants. 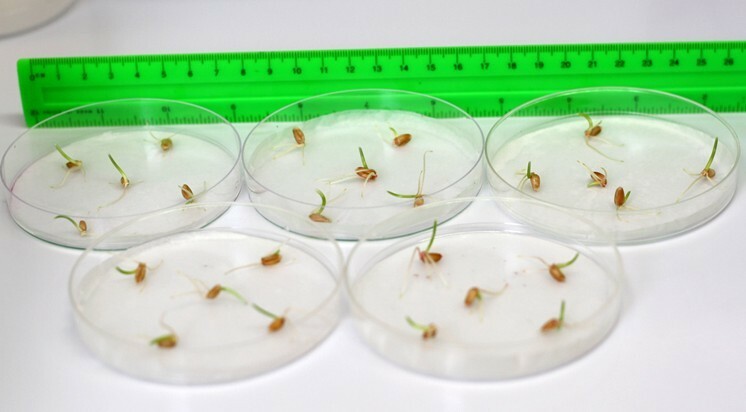 This method explains a simple procedure to establish germination percentage in wheat seeds. Obtain a representative sample (i.e. seeds of a particular variety or cultivar) of your wheat seeds. Random selection within this sample is required to avoid any bias. The rest of the procedure is done under Laminar flow hood. Wipe the working area with alcohol and alcohol/flame sterilize the forceps. Spread fresh Whatman paper 1 on the petri dish and moisten until thoroughly damp (~2 ml water is added in our case). Avoid standing water above the Whatman paper 1. The seeds are placed in petri dishes, covered with disinfecting (5% (w/v) sodium hypochlorite) for 15 min, stirred, drained, and washed four times with sterile deionized water. Gently place the seeds spread out in the petri dish with a sterile forceps and record time. Use four replicates of five seeds per dish. It is advisable to have extra sets in case of microbial contamination. Place the petri dishes with seeds in a dark place with stable room temperature (~73 °F). Seeds are considered to be germinated when radicle has emerged approximately ≥ 2 mm (Figure 1). Germination percentage is recorded every 24 h for 6 days. Keep an eye for contamination. Do not let the whatman 1 paper dry out (Periodically inspect the moisture level with the help of a timer. In our case every 12 h, ~1 ml sterile water was added under aseptic conditions to each of the petri dishes). This protocol is adapted from Manmathan et al. (2013). Maynard, Donald N. and George J. Hochmuth. 1997. Knotts Handbook for Vegetable Growers, 4th Edition. New York: John Wiley and Sons, Inc. Yaklich, R.W., Editor. (1985). Rules for Testing Seeds, J Seed Technol. Lansing, Michigan: Association of Official Seed Analysts. Vol. 6, No. 2. How to cite: Manmathan, H. and Lapitan, N. L. (2013). Measuring Germination Percentage in Wheat. Bio-protocol 3(16): e866. DOI: 10.21769/BioProtoc.866.